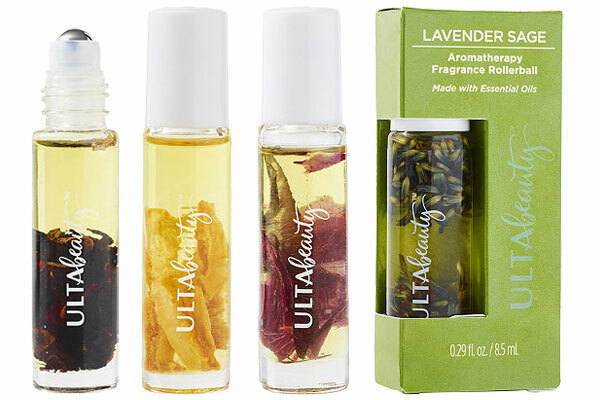 Aromatherapy Fragrance Rollerballs by ULTA - Infused with essential oils, this aromatic collection includes Lavender Sage to calm and relax your mind and body, Coconut Rose to lift your spirits, Grapefruit Citrus to relieve stress and lighten your mood, and Hibiscus Vanilla to soothe and relax your body and mind. These new aromatherapy rollerballs are "formulated without DEA, Gluten, Parabens, Phthalates, TEA" and include argan oil and vitamin E.
"Apply oil to wrists, temples, chest or inside elbows to experience the aromatherapy benefits and ease your body and mind." Feeling a little tense? Help calm and relax your body and mind with Ulta's Lavender Sage Aromatherapy Fragrance Rollerball. Made with Lavender Oil and Sage Essential Oils, this little rollerball will have you feeling relaxed in no time. Filled with lavender bud botanicals. Need a pick me up? Help lift your spirits and bring on the zen with Ulta's Coconut Rose Aromatherapy Fragrance Rollerball. Made with Rose Oil Essential Oil and Coconut Oil, this little rollerball will lift your mood in no time. Filled with red rose petal botanicals. Feeling a little stressed? Help lighten your mood and bring on the positive vibes with Ulta's Grapefruit Citrus Aromatherapy Fragrance Rollerball. Made with Orange and Grapefruit Essential Oils, this little rollerball will lighten your mood in no time. Filled with orange peel botanicals. Feeling a bit overworked? Help soothe and relax your body and mind with Ulta's Hibiscus Vanilla Aromatherapy Fragrance Rollerball. Made with Hibiscus Essential Oil and Vanilla Fruit Extract, this little rollerball will have you feeling a bit more relaxed in no time. Filled with hibiscus flower botanicals.